Idaho Big Game Hunting - Elk Hunting in Idaho - Big bucks Boulder Creek Outfitters is the place to go for some awesome Western Whitetail action. 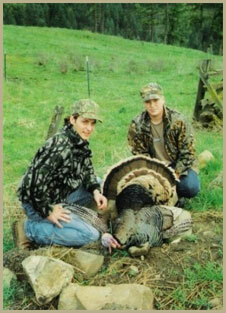 For the bird hunter out there we offer an excellent spring turkey hunt at our Peck and Whitebird ranches. 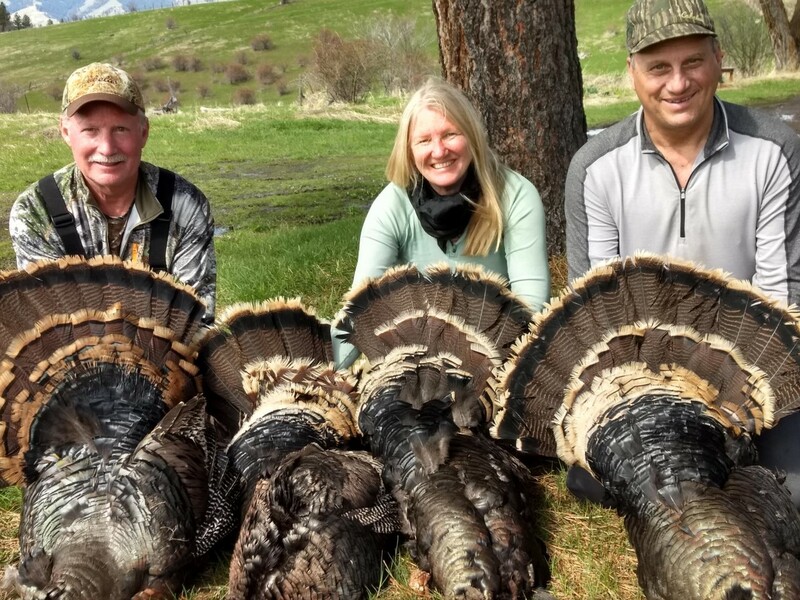 These ranches feature the most absolutely perfect turkey habitat in all of Idaho, which has led to our region holding the densest population of turkeys in the state. 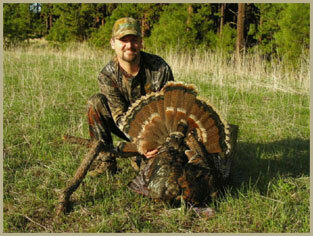 The turkey season here starts April 15th and goes through mid-May, and after May 1st you can pick up a 2nd turkey tag. We hunt only mature birds and since we maintain such a healthy turkey population on our land we have been running 100% opportunity on the first bird and most hunters will fill their second tag as well. The size of turkey we usually harvest is a mature tom ranging anywhere from a 6 inch beard up to 11 inches, with even dragging on the ground. Realtrees Bill Jordan took a tom with an 11 inch beard on this hunt, Walter Parrot, 3 Time World Champion turkey caller, lured in the big tom for Jordan. This hunt includes all lodging and food will be provided for you to cook at the lodge. We have a nice lodge with all modern facilities including full bathrooms and comfortable beds and main living area. For this hunt we offer either a full-guided hunt or a non-guided hunt. The full-guided option would be a 1 on 2 hunt, and the non-guided means we allow you access to the ranch and lodging. We offer this as a 2 to 3 day hunt, depending on whether or not you want to go after the 2nd turkey.